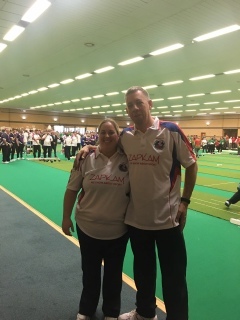 Becci Cox and John Mills, both of Woolhope SMBC, represented England for the first time in the 2018 British Isles Championships held in Cardiff. Playing in the England ‘A’ squad Becci played in the Triples discipline where, although all 3 matches ended in defeat, two of these, against Wales & Scotland, went down to last end deciders. 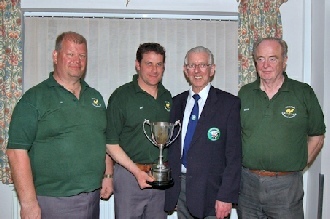 John played in a successful Fours team who finished runners-up to Ireland by a single shot in their competition after finishing level on points. Other Herefordshire players representing England in the current season are Kate Williams (Ross) who is in the England Ladies squad and Dominic Rogers (Woolhope) in the England Under 21 squad. Following on from the county’s best ever showing in the National Championships there was further evidence of the county’s increasing ability to compete at a national level when two of the county’s club teams put in their best ever performances in the National Club Championships. Woolhope and Ross each had a team in the 16 club finals held in Torquay and both teams competed in round robin groups with some of the country’s top club teams, most of them boasting several England team players. Despite some satisfying victories neither team managed to qualify for the main knockout competition and both entered the plate competition. 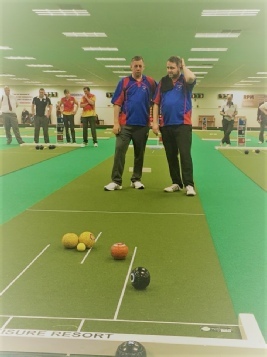 After wins in the quarter finals the two teams met at the semi-final stage and, in a reversal of this season’s general fortunes, county league and cup winners Woolhope found their rivals in good form and Ross won all disciplines to progress to the plate final. The final proved to be a tight affair against Kingscliffe from Somerset but, despite winning 2 of the 4 disciplines, Ross were squeezed out by a mere 2 shots overall in a thrilling finale. Both teams had just cause to be well satisfied with their weekend’s bowling. The 2018 National Championships proved to be the best ever for the county. 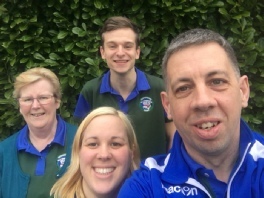 The Mixed Four of Joe Loveys (Gorsley Chapel), John Mills, Shirley & Becci Cox (Woolhope) started the ball rolling with the county’s first appearance in a semi-final since 2003 when Pam & Neil Kellett, in the Pairs, had been the first county bowlers to reach that stage. Success then followed like the proverbial buses and John Mills and Shaun Jones (Ross) repeated the feat in the Pairs later that week. Finally, Mark Cinderey (Llangarron), David Millington Jones, Phil & Anthony Rogers (Woolhope) reached the quarter-finals of the Fours with Kate Williams (Ross), John Mills, Shirley & Becci Cox also qualifying from their round robin group before falling in the round of 32. Congratulations to all of these bowlers as well as those who represented the county but failed to qualify from their round robin groups, some of them missing out by very narrow margins. The first Woolhope Charity Fours, held at Leominster IBC in September 2017 was a huge success with 24 teams from England and Wales entering and a huge £1,500 raised for St Michael’s Hospice. Money was raised from entries, donations, a cake sale, silent auction and raffles and the cheque was presented by club members to Paddy Nugent, the hospice’s Community Fundraising Manager. A stalwart of the county game was recognised at the recent Herefordshire Sports Awards. 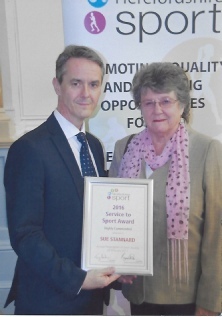 Sue Stannard, a member of the Fownhope club since 1997, was Highly Commended in the Services to Sport category of the awards which were presented in a ceremony at Hereford Shire Hall. Sue has played club and county bowls for many years and served for 6 years on the Fownhope committee and she is familiar to players around the county in her role as County Secretary, a post she has held since the formation of the county association in 1999. Not only has she fulfilled that demanding office, but for the majority of that period she has also been County Membership Secretary. She has also regularly helped other committee members run the county competitions and organise other events, most notably the annual Macmillan Cancer Support charity tournament which Sue has been involved with since its inception and which has raised well in excess of £25,000 for the charity. This award is well-deserved recognition of her invaluable contribution to short mat bowls in Herefordshire. The county Premier team qualified for the finals of the 2016-17 ICC Rinks competition by winning their qualifying group. After defeating Surrey convincingly by 46 shots to 30 they then had a very close match with Essex which, after a very tense climax, was drawn 46 shots each. Surrey then beat Essex to see Herefordshire claim top spot in the group and progress to the finals in January. 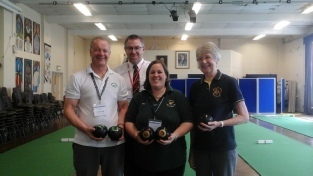 More than 120 pupils from the Bishop of Hereford’s Bluecoats School were given an introduction to short mat bowls as part of the school’s end of term enrichment programme. The sessions were facilitated by HSMBA volunteers, including Dominic Rogers, a year 8 pupil at the school who is also a member of the England Under-21 squad. 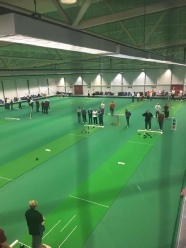 The association and its members provided the equipment for the 3 days of sessions and the main school hall was an ideal short mat bowls venue, comfortably accommodating 4 mats on what proved to be an excellent floor. The inclusion of short mat bowls in the programme of activities was the brainchild of HSMBA member Mark Cinderey, a teacher at the school. 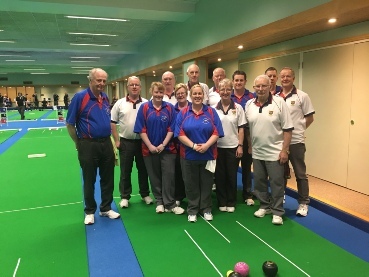 The Herefordshire county team played in their first ever final at Premier level when they contested the Inter County Championship Premier Consolation Final against Northamptonshire at Daventry Indoor Bowling Centre. A comprehensive 28-12 semi-final win over Wiltshire at the same venue had brought them through to the final against a highly rated Northants side but the Herefordshire team put in a highly creditable performance, finally slipping to a 23-17 defeat. 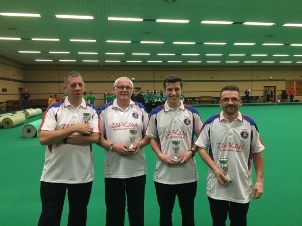 The Northants victory was underpinned by their two singles players, both experienced internationals with national championships titles to their names, who took all 10 points in the Singles discipline. 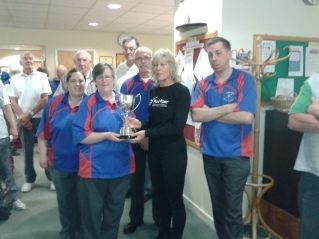 Herefordshire more than held their own in the rest of the match, winning the Pairs 7-3 and the Triples 6-4. Although the Fours shared their matches they lost the shots bonus to go down 4-6. 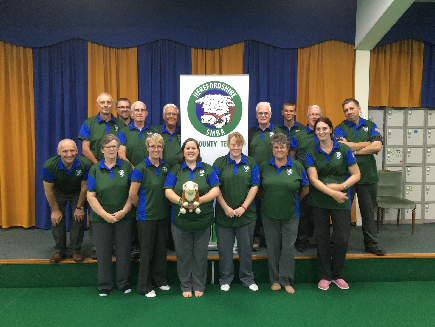 Congratulations to the Herefordshire bowlers who have been successful in winning places in England squads for the 2015-16 season. Becci & Shirley Cox (Woolhope SMBC), Charlotte Kite (Lea SMBC) and Kate Williams (Ross BC) have all been selected to represent England Ladies in the coming season and Becci Cox has also been appointed as vice-captain of the team. Joseph Loveys (Gorsley Chapel SMBC), Luke Rawlings (Larruperz SMBC), Dominic Rogers (Woolhope SMBC) and Kate Williams (Ross BC) have all been selected to join the England Under-21 squad. 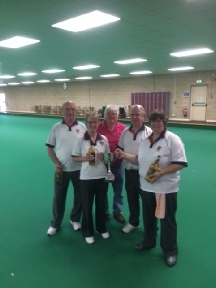 Congratulations to Rod Dawson, John Mills, Shirley & Becci Cox of Woolhope SMBC on their success in the Gloucestershire Charity Open Fours event held at Mid Glos Indoor Bowls Centre on 19th April 2015. Woolhope were the only team to win all 5 of their games and their success meant they retained the trophy within the club following last year’s success, albeit by a completely different team from the club. 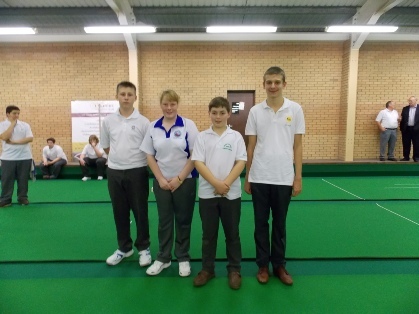 5 young Herefordshire short mat bowlers represented England Under-21’s in an international match last week against Wales in Carmarthen. Kate Williams (Lea SMBC), who captained the England team on the day, was joined by Cameron Johnson (Fownhope SMBC), Matthew Kite (Lea SMBC), Joseph Loveys (Gorsley Chapel SMBC) and Luke Rawlings (Larruperz SMBC). 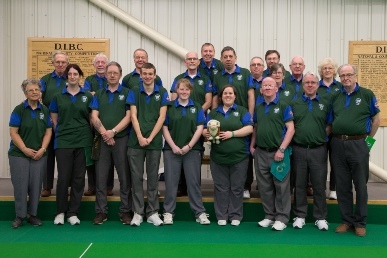 Brian Claessen, the England Under-21’s manager, was pleased with his team’s performance, despite the strong Wales team winning the match by a 38-18 point margin, and he paid tribute to the Wales Short Mat Bowling Association for their excellent organisation of the day. 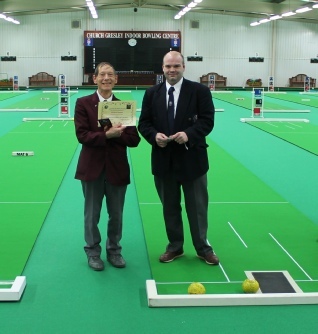 Congratulations to David Millington-Jones, Ian Park, Fred Jolley and Anthony Rogers of Woolhope SMBC on their success in the Gloucestershire Charity Open Fours event held at Mid Glos Indoor Bowls Centre on 12th April 2014. Woolhope were one of only two teams to win all 5 of their games, edging out the Essex team of East Hanningfield on ends won. Herefordshire were also represented by teams from Fownhope, Gorsley Chapel, Llangarron and Ross. 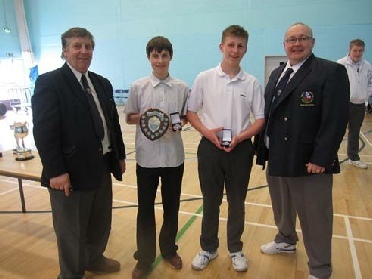 Luke Rawlings (Larruperz SMBC, pictured second from right) is seen receiving his runners-up medal in the Woodbridge Trophy, the Under-18’s plate competition, at the 2014 National Short Mat Championships. Luke came up against more experienced bowlers in his round robin group but advanced to the plate competition where he really hit form, advancing through the knockout rounds and winning his semi-final by a single shot. Despite losing in the final to Nathan Bailey of the West Midlands Luke can be proud of his fine performance. 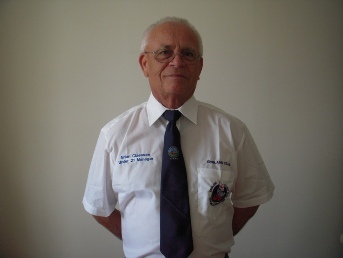 Congratulations to Brian Claessen of Lea Short Mat Bowling Club on being appointed as manager of the England Under-21 short mat bowling squad. 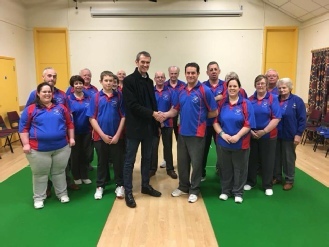 This prestigious appointment recognises the valuable work that Brian has done in encouraging younger bowlers into the sport, including the recent establishment of a junior competition within Herefordshire. Joseph Loveys has done it again! 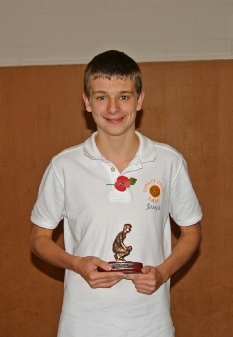 He was the top Junior bowler in the Macmillan Competition this year for the third time. He was the winner in 2009, 2011, 2012 and runner up in 2010. Joseph is a very keen bowler and responded well to coaching this summer which has really improved his game. He is very dedicated to doing well, encouraged by his grandfather Derek Wadley and the Gorsley Chapel club.